This is our tried and true carrot cake recipe we commonly make for birthdays or special gatherings. It is a gluten-free flourless cake with no baking required. All you'll need is a food processor for the cake ingredients and a blender for the cashew cream cheese frosting. While eating a raw carrot cake might seem a bit odd at first, rest assured it is not at all as unappetizing as it may sound. This particular recipe, we have perfected over the years, offers the best blend of dense cake-like texture and thick, smooth, sweet cheesy frosting. In addition, it also has some of the same flavors as the traditional carrot cake you may be familiar with. 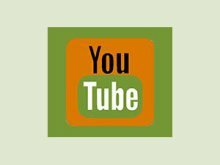 This version, however, is energizing, easy to digest and won't make you feel lethargic. You can basically eat it for breakfast or as a main meal, not just as a dessert. It is especially appropriate after an exercise routine or intensive workout. 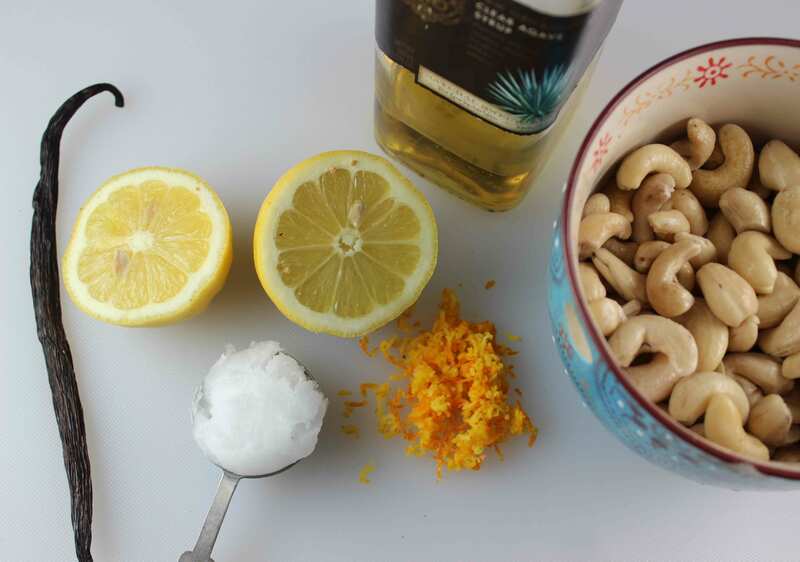 It also makes a great alternative to less-than healthy morning muffins or donuts and is delicious with a cup of hot herbal tea or a Chinese tonic brew. 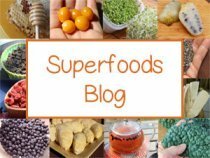 Many of our homemade recipes tend to focus on incorporating as many different superfoods as possible, and we don't stop at dessert recipes. There is really no reason to when you "can have your cake and eat it too!" 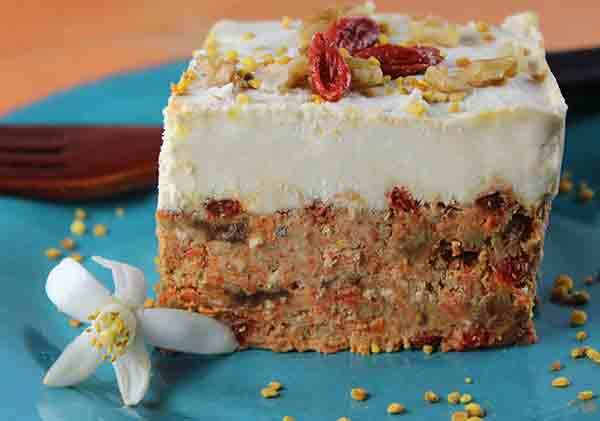 While the main cake portion of this carrot cake recipe is made from coconut flour, ground walnuts, dates, shredded coconut and of course carrots, the rest integrates a few of our top superfood favorites. 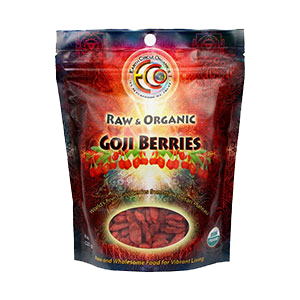 We use goji berries instead of raisins and also include bee pollen to boost nutrient levels as well as cordyceps powder known for its revitalizing effects on the adrenals, physical stamina and sexual functions. Lucuma powder is also the perfect fit for the main cake layer, providing a fine flour-like consistency and lower glycemic index. For the frosting we use either maple syrup or a quality agave blended with the sweetness of cashews and the richness of coconut oil for a thick smooth texture. Traditional carrot cake spices commonly include cinnamon, we also add in nutmeg, cardamom, coriander, and freshly grated ginger to help activate the digestive fire and increase the delivery of superfood constituents and other nutrients. We love to use fresh "scrapped" paste from the vanilla bean in many of our dessert recipes. There is nothing quite like the flavor. 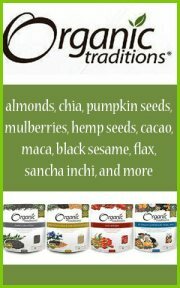 Powders and extracts just don't compare. Vanilla beans can be purchased and stored in the fridge until you're ready to use them. Though they can be somewhat costly, about $2-5 a bean, they are well worth the price for the occasional carrot cake recipe or other healthy sweet treat or confection. When using fresh vanilla, you basically cut the portion you want for your recipe, then slice it lengthwise. From here you can scrap the soft black seedy paste from the center with the back of a butter knife. 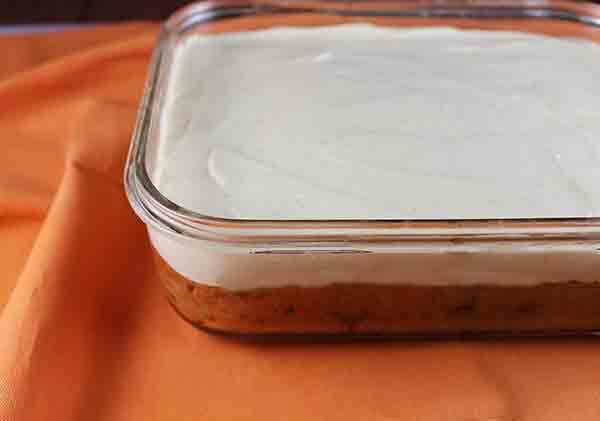 For this raw carrot cake you will be using it in both the cake as well as the frosting layer. Soak dates in 1/2C water for 30 minutes. Process the carrots in a food processor until finely chopped. Place in a big bowl. Process walnuts, bee pollen and dates together. Add to the bowl. 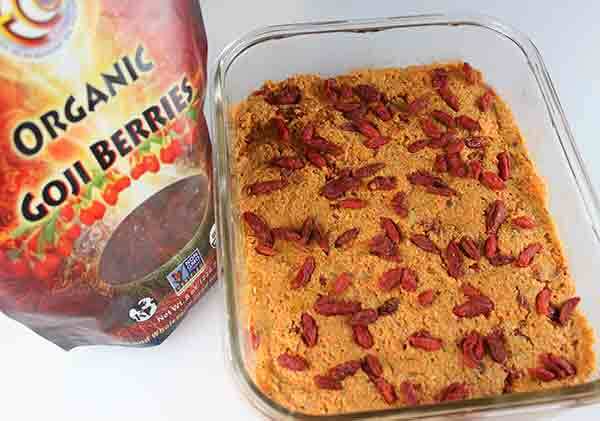 Add 1/4C goji berries and the remaining ingredients and mix either with your clean hands, a spoon or spatula. 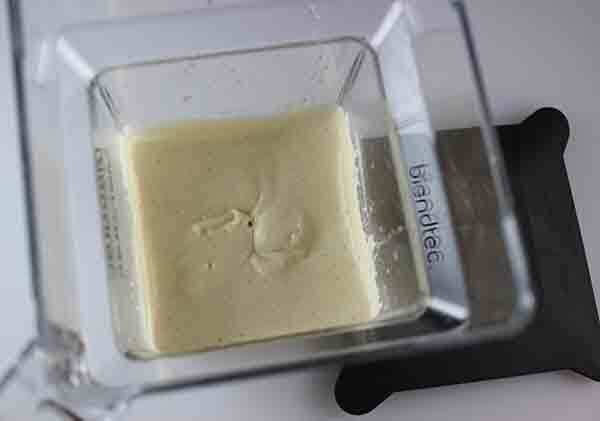 Press the cake mixture into a rectangular glass dish or spring-form pan. Sprinkle the 2T goji on top of this cake layer. Soak the remaining 2T goji for use as a topping. Cover cake and refrigerate 1 hour before spreading the frosting layer. 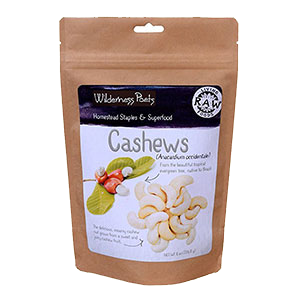 Soak 2C cashews in 1C water for several hours. Blend all frosting ingredients in a high speed blending device. Spread over goji carrot cake evenly with a frosting spatula. 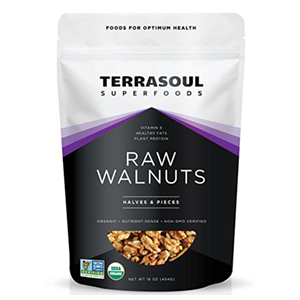 Top with chopped walnuts, bee pollen, goji berries and orange blossoms or other flowers. 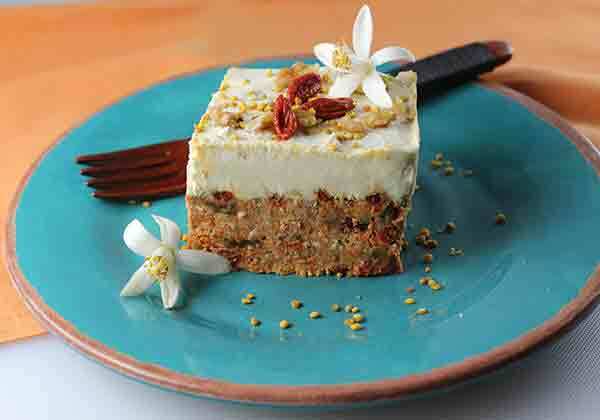 Enjoy this raw carrot cake recipe with family and friends. 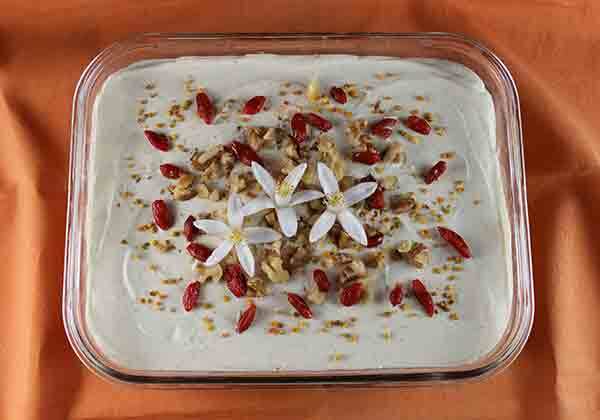 It makes a great dessert for parties, potlucks or as a birthday cake! It can be stored in the glass dish in the fridge and will last between 5-6 days. We have also preserved it for much longer in the freezer, if you're not going to consume it within a week. 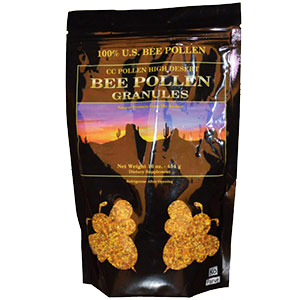 While bee pollen is a nutritious superfood we love to include in many recipes, especially desserts, as it has a sweet and tangy flavor, for some people too much or even a small amount can cause adverse reactions for certain body types or those with allergic sensitivities. It is therefore a good idea to start out with small measurements in this recipe if you are new to consuming it.